Answer email at all hours of the day and night. Work long hours – even weekends. Feel you often do other people’s work. Don’t get rewarded for some of the work you do. Sometimes miss key deliverables associated with your key performance objectives. You want change. 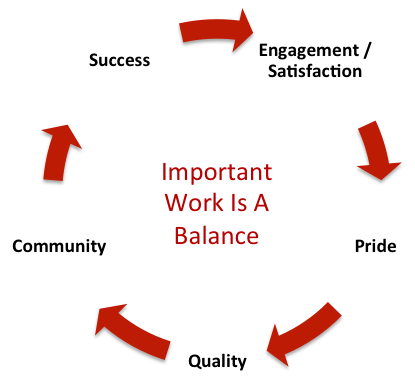 You want a work-life balance you see others enjoying. The first thing I would like you to consider is that busy doesn’t mean important. In fact, busy work often means your important work is not getting done and the quality of your work is suffering. Working more effectively means being able to make important work your priority. Scheduling your important work is one of many time management skills that can help you fulfill your dreams… but change isn’t easy. Learning how to schedule your important work first takes practice and often coaching. Ask yourself “What are my top priorities?” You need to define what you need to do today to be successful tomorrow… and even more successful in 18 months. For individuals, important work means identifying all of the tasks, steps, partners and dates that are critical to you reaching your key performance objectives and / or driving your business forward. For a sales professional, important work might mean reviewing last years high-growth markets so you can identify and make contact with enough qualified sales calls to meet your end-of-year sales target. Smart companies (or Presidents / Boards) know what the long-term goals are and how these goals break down into important work for each department and individual. For a company like Apple, important work means aligning all the tasks and decisions thousands of employees must complete for Apple to stay on schedule with a new product release. Important work and time management skills are a balance of many things. They depend on your job, personality, support systems, natural abilities, education and many other influences. Whether they are personal objectives or corporate objectives, important work has to be planned for and has to have the appropriate time set aside. One of the most common time management challenges is that long-term objectives are pushed aside and less important busy work assigned until important work becomes urgent work. Important work should also engage your creativity, be useful and make you proud. Nobody will fully invest their talents and create high-quality work if they expect it will be ignored. How To Identify Busy Work? Work is bad if it distracts you from your key performance objectives… unless you purposely use it to fill a temporary gap in your schedule (or experience). One of the most common reasons people feel overworked and not recognized is because they get pulled into urgent work that’s not their responsibility. Is any of your current work someone else’s responsibility? Your boss or associates may try to pull you away from your important work without realizing the impact they are having on your deliverables as they try to meet their key performance objectives. But remember; important work for them might be busy work for you. You might need to learn to say no… carefully. When this happens your customers (and boss) lose confidence in you! What’s The Impact Of Effective Time Management Skills? Less stress for you and the people around you. To be an effective time manager you have to be clear on your key performance objectives. To be clear about what these objectives are, it’s good for you (and for your boss / associates), to write down AND schedule your important projects. People and companies that manage time well often are more responsible to their market, their customers and build more creative solutions since they take time to plan, research or brainstorm projects / objectives. Here are a few more time management tips to get your started. Good time management helps you focus on your important work. Even when you are delayed you have an opportunity to do more than procrastinate. I always have important work with me to read or edit. Most of the time I don’t need it but for the times a meeting is delayed or cancelled I am very happy I have it. One of the biggest time wasters are the short interruptions and quick questions people ask us throughout the day. This is similar to trying to multitask – and research shows that productivity drops when we try this. The result is that errors go up and quality goes down. What if every day between 10:30 and 1:00 PM was quiet time with no calls, no email, no interruptions, no meeting for your whole department? 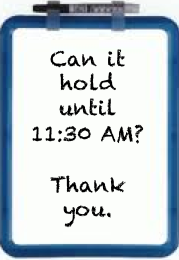 What if you hung a “Can it Hold” or “Unavailable until 11:30 AM” sign at the entrance to your office / desk or on the back of your chair. This is more positive than a “Do Not Disturb” sign. Encourage others in your office to do the same. Help manage people’s expectations about your needs – and theirs. Turn off your email, IM service, telephone and smart phone. Check them 3 or 4 times a day – even hourly… whatever makes sense for your job. But the distraction caused by the constant ringing drops your productivity, quality and creativity like a stone. Leave some time open in your schedule every day to deal with “items that have developed” especially if you have people reporting into you. If nothing happens during this time – treat yourself to a coffee, go for a walk, then get a jump on your next project, brainstorm an idea you’ve had or make a few courtesy client / supplier calls. The important thing here is to prepare for the unexpected to happen. If you don’t “Urgent” issues will have negative repercussions in the short AND long-term. Effective time management means that the important tasks get done first – and that you do these tasks when you are at your best. If you want to improve your time management skills you have to start by defining your job / work responsibilities and then identify the ‘important’ work that will lead to your success. Who do I have to involve – and put on notice? What are the critical timelines / project milestones? Are some of your work habits (time management skills), holding you back? It’s time for you to achieve greatness. Email Etiquette: Should You Reply To My Email?